We planted a bunch of butternut squash in our summer garden this year. Although I wasn't expected much of a crop, since it was our first time, I was excited at the prospects. Not being a vegetable I routinely cooked at home I was on a mission to find the best recipe. The one below, which was adapted from Closet Cooking, seemed like a good place to start. 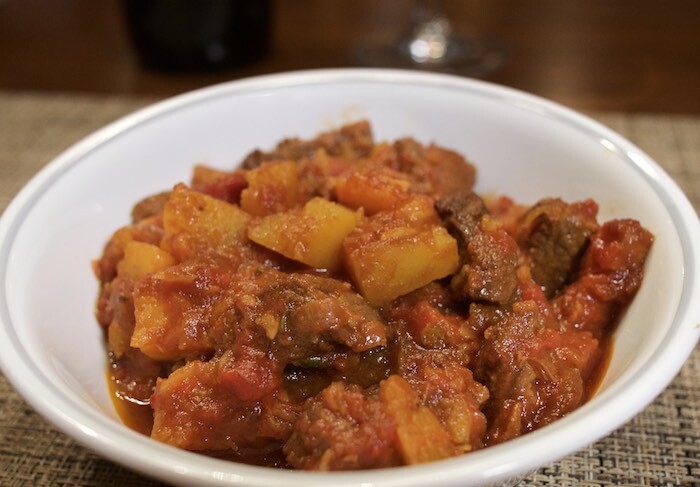 The delicate yet earthy flavor of butternut squash is reminiscent of fall as is the hearty, warming feeling of beef stew. It's only logical then to combine the two into a big bowl of fall comfort. This one recipe alone will make me plant butternut squash again next year! In a large pan over medium heat, cook the pancetta until browned and crisped about 5 minutes. Add the beef cubes and brown on all sides. Remove the beef & pancetta from the pan and set aside. Add the onion and saute until translucent, about 5-7 minutes. Add the garlic, red pepper flakes and thyme cooking until fragrant, about 1-2 minutes. Use the wine to deglaze the pan. Add the beef and pancetta back in, along with the broth, balsamic vinegar, hand crushed tomatoes, Parmesan rind, and oregano. Bring this to a boil. Reduce the heat, cover and simmer until the beef is fork tender, approximately1-2 hours. Add the butternut squash and simmer until tender, about 15-20 minutes. Season with salt to taste. Serve in bowls topped with additional Parmesan. I adore beef stew. I too have a ton of winter squash. Love this recipe. You had me at butternut squash. I love comfort food! Yum! What a perfect fall stew! Now I want to grow butternut quash also! Butternut squash and beef go so incredibly well together! This is my love language: stew! Lovely recipe! I love beef stew, such a nice fall twist with the butternut squash! Mmmm..Love all that butternut squash in there. Now is the perfect weather for beef stew. Love the flavors here - totally Fall in a bowl! I love how hearty and comforting this looks! I'd never thought of using butternut squash is stew. What a great swap for potatoes.